In honour of Volunteers’ Week, from 1-7 June, we’re putting the spotlight on some of our outstanding volunteers across the charity. Without them, Cats Protection wouldn’t be able to help the thousands of cats that we do every single year. Today we’re looking at the role of 19-year-old Rakib Hussain, who’s a Neutering Officer for North Birmingham Branch. Cats Protection champions neutering as the only effective way to reduce the number of unwanted cats in the UK and it has many benefits for cats and their owners, including your cat being less likely to roam, fight and spray. 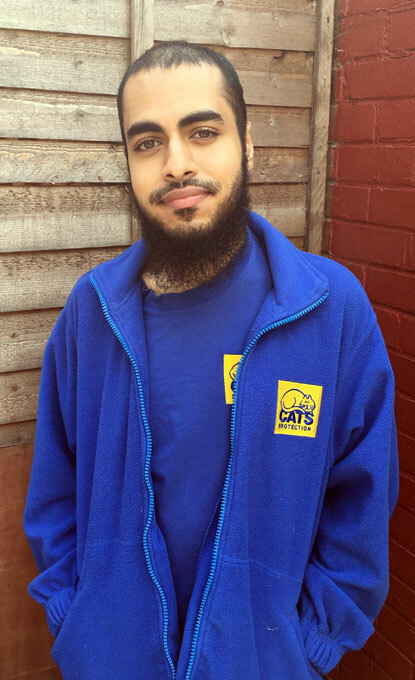 “As a Neutering Officer, I am responsible for responding to enquiries that come in via our phone helpline and sending out neutering vouchers, or following up with a letter and other information/flyers etc as appropriate,” says Rakib. Rakib joined the charity over a month ago after stumbling across a YouTube video on fostering. “I did not feel that fostering was for me but I was keen on finding out other volunteering opportunities. When I had a look at my branch's volunteering page to my surprise I found a number of roles and I applied to what I felt was most suitable for me – the Neutering Officer. Rakib’s interest in cat welfare started at just 15 years old. “My initial contact with Cats Protection was to discuss the issue my area faced with the number of community cats that had concerned me. As a 15 year old I was unaware of what needed to be done to prevent the unwanted litter of kittens and help the stray cats. The telephone conversation I had with a volunteer who I now keep in touch with was one of the most informative conversations I have ever had as I was educated on the welfare of felines. “Thanks to Cats Protection, my area was introduced to a neutering campaign in which a number of cats and kittens were neutered or spayed. This campaign was extremely successful and I was blown away with the progress, as the number of feral cats has decreased greatly. To know that Cats Protection prevented further more unwanted kittens from being born which go on to be feral inspired me very much to go on to apply as I got older. Thanks to all volunteers past, present and future and to everyone who supports, enables, manages and leads volunteering within Cats Protection. Our volunteers make a difference in every part of the organisation, in our communities and to all the cats we help every year. National Cat Awards 2017 finalists: revealed!